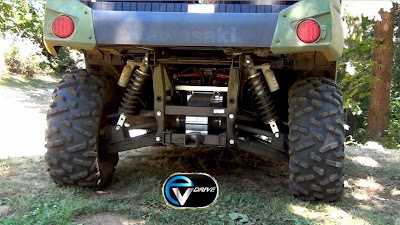 EVDrive completed development and demonstrated a powersports industry first, an "electric 4-wheel 4-electric-motor torque vectoring technology" called Terra-Torque-Drive™, specifically geared to 4-wheel off-road powersports vehicles, such as for the rapidly growing market segment of side by side Utility Terrain Vehicles or UTVs. After taking recent demo rides in the EVDrive-UTV tech demonstrator, powersports industry insiders, such as UTV OEM reps and UTV racers enthusiastically agree, that the Terra-Torque-Drive™, technology would beat almost all of today's top "gas/mechanical powered" 4wd UTVs. OEMs now have the opportunity to license this unique technology for integration into their own future powersports side by side UTV vehicle offerings. 4 - Torque and power from -100 to +100% can be dynamically sent to any wheel, in either direction, in any combination, at any time. 7 - Lower cost to maintain and operate - superior fuel economy, estimated average 50-100% better – for short trips, no fuel may be needed at all – plug-in to standard electric car chargers. 9 - Greater river depth traversal possible due to completely sealed liquid cooled e-motors/power electronics. 11 - Torque vectoring software platform allows new traction capabilities to be supported like "apps" without costly mechanical NRE expenses to the OEM – OEM can provide customers software updates for new capabilities. 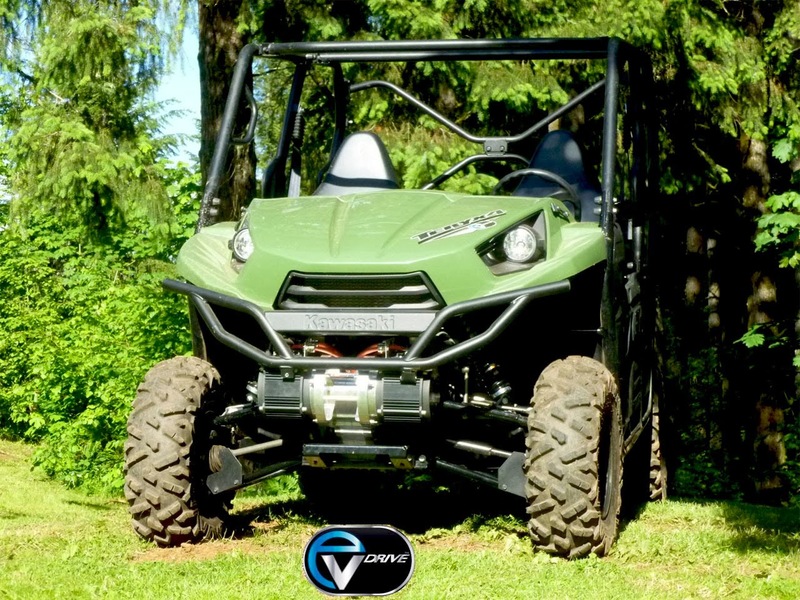 EVDrive chose the 4-seat Kawasaki Teryx4 as a tech demonstration platform because of its short wheelbase, smaller turning radius, and large break over angle to minimize getting hung up on obstacles. EVDrive modified this UTV with complete removal of the gas engine and AWD mechanical drivetrain and replaced with a 160hp peak total version of the Terra-Torque-Drive™. Unlike the stock Kawasaki Teryx4 UTV mechanical AWD drive, no additional mechanical losses are incurred in the Terra-Torque-Drive™, regardless of AWD mode from lack of transmission, driveshafts and differentials. "Off-road UTVs are ideally suited to our torque vectoring technology where only single fixed speed reduction is required per motor-wheel to attain 55-75mph top-speeds with the type of high RPM brushless motor technology we employ," said COO, co-founder, Steve Tice. 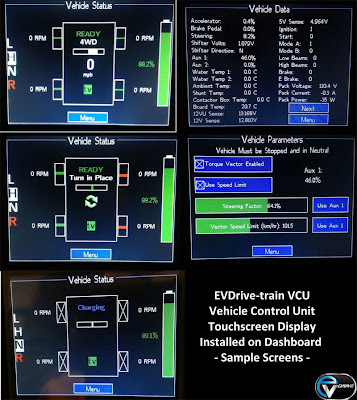 The Terra-Torque-Drive™, is a customized version of the general and modular EVDrive-Train architecture™ (http://bit.ly/EVD-Arch) used on all EVDrive conversion projects, with an in-house developed scale-able torque vector software platform added running on the EVDrive VCU (vehicle control unit), which supports new traction modes with inputs from all driver controls plus vehicle sensors such as accelerometers, etc. Some planned traction modes, that go beyond what is currently running on the demonstrator: auto dynamic terrain type posi-traction control, variable inclination angle offset descent control, zero radius turns on incline, emergency 4-wheel panic braking/stop & boulder climbing. The Terra-Torque-Drive™, powered e-UTV demonstrator uses 4 of the sealed liquid-cooled EVDrive EVD35 35kW/47HP peak drive sub-systems, de-tuned to ~30kW/40HP each or delivering a total of ~160HP/120kW peak. At each motor shaft, ~66 ft-lbs peak torque is delivered. The 4 gearboxes allow ratio changes with off-the-shelf gearsets. With the currently installed single speed gearsets, at the CV joint of each wheel, a whopping 726 ft-lbs peak torque is delivered. This is the kind of torque necessary to perform Zero Radius Turns with a fully loaded vehicle and perhaps even some extreme rock climbing. "With these gearsets, a top speed of 45mph is achieved with acceleration to this speed of less than 4 seconds if you get good traction – at zero speed all 4 wheels will break loose on dry asphalt!" said EVDrive's CTO & co-founder, Bob Simpson. 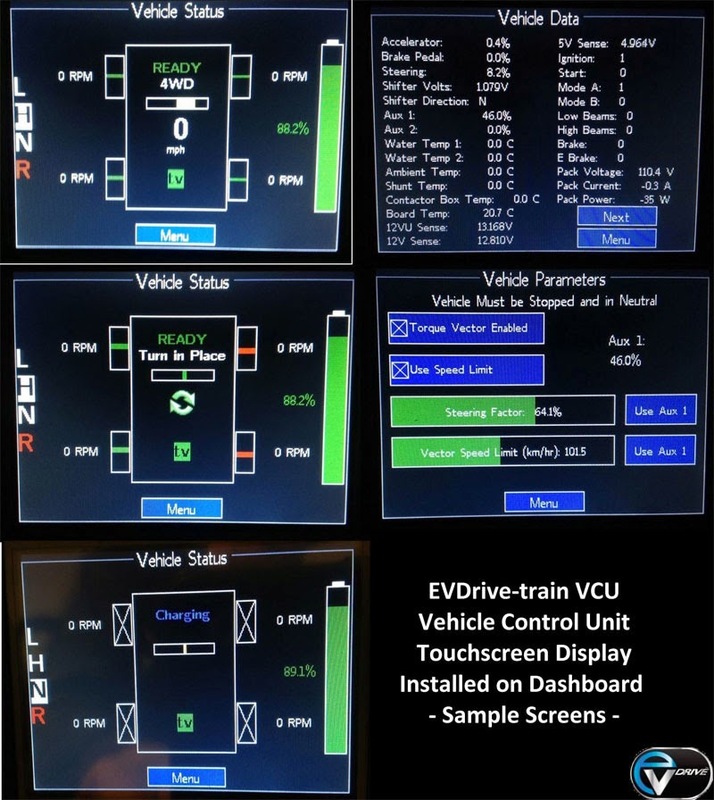 In the accompanying video to this press release, some of the e-UTV tech demonstrator more technical features are revealed, such as: control touch screen for the Terra-Torque-Drive™, specifically the interface to the in-house developed VCU, shown in accompanying picture links below, and optional engine sound synthesis unit some OEMs expressed interest in, with 2 sounds demonstrated in the video, a gas turbine and V-twin motorcycle sound. Addition of the15kW REX not only gives the UTV full performance and range to match and exceed top UTVs on the market but also offers a feature the competition does not, that is 120vac of electrical power anywhere you need it. "With the REX sub-system part of the Terra-Torque-Drive™, a hybrid UTV can be a true swiss-army-knife UTV, able to deliver power in remote locations for construction/utility/ranch applications, run silent for hunting/wildlife observation & with full-time 4wd torque vectoring, can deliver off-road handling and performance for sports/recreation, in summary, addressing all needs in the consumer, prosumer and commercial markets," said CEO, Steve Tice. "Similar to our 25kW REX technology installed in our Series-PHEV BMW325 tech testbed -> http://bit.ly/PHEV-BMW-3-series but smaller, our custom high voltage 15kW-single cylinder (ICE) powered REX for the UTV is located between the rear seats – so with this sub-system, competing against top 4-seat UTVs in range will not be a problem - certainly the performance meets and beats stock UTVs we have tested" said EVDrive's CTO Bob Simpson. The REX gas engine can be modified to run on LPG as well offering additional emissions and operational cost advantages. EVDrive's REX technology supporting the hybrid e-UTV development has been already designed & proven in EVDrive Series PHEV BMW 325i Technology Testbed here shown sealed below rear spare tire floor - no protrusion above stock floor as shown in pictures at link included above. EV West is partnering with EVDrive to deploy and demonstrate Terra-Digital-Torque-Steer™ all-wheel torque vectoring technology on full-size off-road vehicles. EV West is known for many milestones; e.g. Builders and drivers of the record breaking all-electric BMW 3-series street sedan at the Pikes Peak International Hill climb and builders of first ever electric off-road race car to run the Baja Mexican 1000 race in the National Off Road Racing Association's series.